are there any original photos of an F-Type in british racing green ...?? Thank´s a lot from Max (Husum, Germany ). I have not found any photos yet of a green F-Type, but if I find one then I will post it here! Thanks a lot, I´m still waiting . I would be very very careful trusting the displayed colors on the jaguar website config/build tools. For example I really like "Satellite Grey" when I see real photo's and also see the actual paint on a car (or a set of paint chips for the F-type) at a car show. But when I see it on the config/build tool the color does nothing for me - it just doesn't look the same. and here (below) is a 1) a 100x100 square pixel image from the build tool, and actaul 100x100 image from a photgraph and 3) a 100x100 picture from the 'pallet' in the build tool in which I selected the color "Satellite Grey". My point is that nothing on the website in the jaguar build tools, e.g. 1) and 3) above, ever comes close to matching the real image e.g. a true picture image e.g. 2) above. 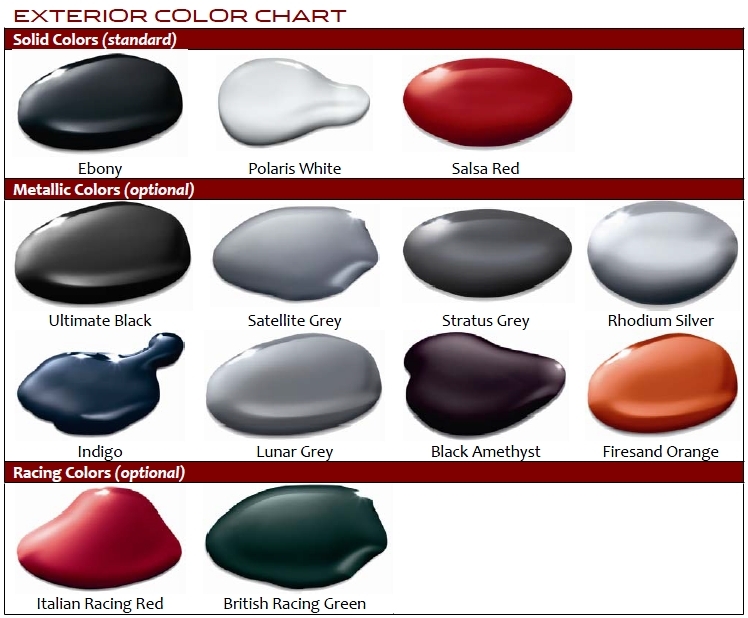 IMHO in the above chart it's kind of hard to tell the difference between "Satellite Grey", "Rhodium Silver", "Lunar Grey" let alone how they look on a real car in real light. In fact I think "Lunar Grey" truly ends much darker on a real car. I would still recommend that you look at the color if possible at an auto show, F-type dealership reveal, or even if it is on a different car at a dealer lot. I know it's tough when you are doing a pre-order e.g. ordering a color sight unseen. I am just now looking at this color thread and it appears that the color chart above is incorrect as the British Racing Green is a metallic color and not the "classic" green of old. Is there really an optional "Racing Color" British Racing Green? I hope this clarifies things for everyone. Thanks Mike, but what is "Xirallic"? Everywhere I see the British Racing Green depicted it seems to be a metallic color, so this begs the question: What is the difference between Xirallic and Metallic paint? Xirallic is a special type of Metallic paint. It is said to give a lighter body colour, a greater colour and glitter intensity. That's why when you briefly see a British Racing Green vehicle it may appear at a quick glance to be metallic. You get the impression from the color chart that Jaguar sees grey as a very good color for the F-Type. Either that, or their customer base wants multiple grey options. I think Silver and all the grey colors are beautiful and frame the F-Type's shape wonderfully. I recently saw photos of a Lunar Grey F-Type V6 S with black wheels, black trim and dark tinted windows and I thought it was the most beautiful F-Type I had ever seen. However, to each their own.